The steps to plan and care for a low-maintenance, low-water xeriscape garden. At High Country Gardens we pride ourselves on offering a wide selection of xeric perennials that can be used to create a low-water, eco-friendly garden. With drought conditions becoming more and more common in the Western United States, people are becoming more aware of how much water is used in their yard. It is possible to have a beautiful blooming garden without having a high water bill to maintain it. There is no need to "zeroscape" your yard, with xeric perennials it is easy to create a beautiful xeriscape. Here is a guide to what it means at High Country Gardens to create a low-maintenance, low-water xeriscape garden. Whether you're starting from scratch, or renovating an existing landscape, take the time to plan out your design before you start to plant. Part of the planning process involves creating water use zones so you can allocate water usage where it will most directly contribute to the beauty and comfort of your home. 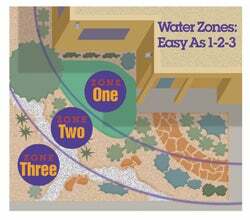 Creating water use zones in your garden can help create a water efficient landscape. The Oasis Zone (zone 1) where the more water-intensive plants are used is the area up close to the house where the landscape is most visible and accessible to the home's interior and entry ways. Use hardy garden perennials, non-xeric groundcovers, ornamental grasses, small ornamental trees, annuals, container gardens, water features. Water harvesting from roof areas and hard surfaces is most easily done here. Vegetable gardens are considered oasis plantings (but do not need to be located next to the house). The Transition Zone (zone 2) where water-wise xeric plants are used in areas that occupy the middle ground of the property especially along walkways, driveways, fences and other areas that are visible as you approach the house. Use xeric perennials, shrubs, shade trees, ornamental grasses and native turf grass lawns. Harvested water is especially useful for irrigating shade trees which need infrequent irrigation once established. The Xeric Zone (zone 3), where only very xeric plants exist, is the outermost area along the property boundary and includes any out-of-the-way areas that are not used or seen much. Use very xeric perennials, shrubs, ornamental grasses. Note: Many homeowners who are not gardeners (and some who just prefer xeric plants opt to forego an oasis zone and bring the transitional zone right up to the house. This gives them the landscaped look they want while providing additional watering savings. For optimum water savings use native grasses such as turf-type Buffalo Grass and Blue Grama grass (in the Western US). 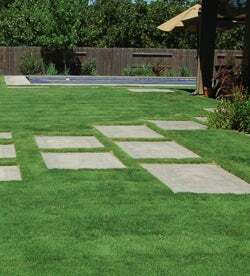 These are excellent drought-tolerant alternatives to thirsty Kentucky Blue Grass and other turf type grasses. Only plant Kentucky Blue Grass or Fescue-type turf lawns in areas where heavy recreational use will occur. Herbaceous and woody groundcovers are an excellent low maintenance, low water lawn alternatives, especially on hillsides or when a less formal look is desired. Use plants that are a good match for your region's growing conditions. Both native and adapted (plants from other continents) need to be adapted to your soil pH, soil type, precipitation levels and weather (winter cold and summer heat). Remember to match plants and microclimates; buildings, walls, topography and mature trees all create small areas with differing microclimates. Pick your plants accordingly. Xeric plants should be used for hot, dry south and west facing areas. Mesic plants (plants that prefer more moisture) should be used in moister areas along north and east facing slopes and walls. Don't mix plants with high and low watering needs in the same planting area. Adding organic matter to the soil at planting time in the form of compost and/or organic fertilizers. Inoculating new transplants with beneficial mycorrhizal root organisms. Continuing to fertilize (feed the soil) regularly with compost and organic fertilizers. This supports a healthy microbial population needed in the soil to break down organic materials and release nutrients to the plants. Avoiding the use of synthetic insecticides and fungicides on the soil that would harm the soil's web of life. Help retain valuable soil moisture by shading the soil from the hot sun. Save water and irrigate established plants less frequently. Capture rainwater by allowing hard rains to soak into the soil instead of running off into the street and drainage areas. Add organic matter to the soil gradually improving the soil from the top down. Moderate soil temperatures making for more optimum root growth conditions. Use a native grass, such as Buffalo grass, as a great drought-tolerant alternative to Kentucky Blue Grass. Water deeply and less frequently to encourage deep root growth. Shallow, frequent irrigation encourages shallow root growth and thirsty plants. Use soaker hoses and drip irrigation to apply water directly to the root zone. Know your soil type and understand how to best apply water to it. Sandy soils need different water schedules than clay soils. As trees grow, move drip emitters further away from the trunk to apply water at the drip line. Harvesting water from roofs, sidewalks, driveways and other hard surfaces and directing it onto your landscape to be stored in the soil is a very practical way of supplementing irrigation water from your well or faucet. If legal in your state, use rain barrels and cisterns to capture and hold water draining off roofs to water potted container gardens and vegetable gardens. A well-planned xeriscape planted with plants well matched to your region's conditions and climate will naturally be a low maintenance type of garden. When ever possible use organic products and techniques to create a balanced, healthy landscape in harmony with the environment. Avoid the lush, thirsty plant growth that results from over-fertilizing with harsh chemical fertilizers; use organic composts and fertilizers applied in the fall instead. Apply more mulch in the fall after fertilizing. Don't prune your shrubs into unnaturally shaped boxes and balls as this creates continuous high-frequency work for years to come. Keep your irrigation systems tuned and maintained at the start of each season. Don't cut back your perennials in the fall. Wait until early to mid-spring of the following year to improve winter cold hardiness of the plants and provide shelter for beneficial insects to over-winter.